Homemade Soft Pretzels | Healthy. Delicious. Homemade soft pretzels that taste exactly like the ones you’d get at a ballpark – this is definitely a recipe you’ll want to bookmark for the next snow day or lazy weekend afternoon! I’m really proud of this pretzel recipe. It took me a few tried to get it right, but the final version is perfect! The chewy, golden brown crust cracks under your teeth as you bite into it but the insides are fluffy and soft. They taste exactly like pretzels should. If you prefer something less traditional, you can substitute cinnamon and sugar for the coarse salt or add 1 tablespoon each sesame and poppy seeds and 1 teaspoon each of dried onion and dried garlic for “everything” pretzels that are awesome dipped in cream cheese. Hungry yet? Head on over to SheKnows to get my Homemade Soft Pretzel Recipe. I’m a sucker for warm soft pretzels, these look incredible. Great photos! I love all home baked breads! These look awesome! I have never made homemade pretzels before but man oh man do I want too! These look awesome! These are fabulous. I love pretzels, especially when hot. These look super scrumptious. The last time I made a pretzel, I was in culinary school. The next lazy snow day (I hope we have one in N.C. soon; okay, not TOO soon), I’ll definitely make these. I love soft pretzels! These look perfect! I haven’t made pretzels at home in forever but they are the best. I love the look of yours and there is nothing like the smell of them coming out of the oven! Soft homemade pretzels are one of my weaknesses! These look totally amazing! Wish I was munching on one right now! When I was little and we used to visit my grandpop in Philadelphia, we would always grab a bag of pretzels from the vendor right off the 95 exit. It was probably pretty gross but to this day, I adore soft pretzels with all of my heart. so excited to have a homemade version! I can’t get enough of pretzels…it’s a snack I never say no to. Your homemade pretzels are just fantastic, Lauren!!! Basically, homemade soft pretzels are my favorite thing in the world. These look fab! You should be proud. These sound great! I’ll take mine with lots odldold fashioned prepared mustard. 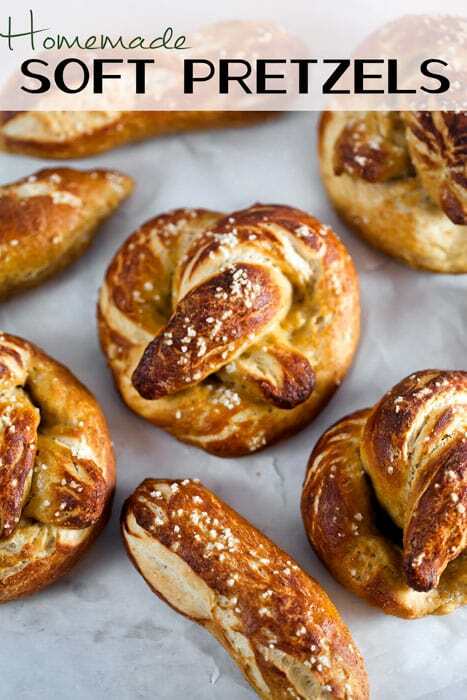 Oh wow – I’m imagining a wonderful smell in my kitchen making these pretzels! YUM! I love making homemade pretzels – these sound perfect. One thing I’ve never attempted is homemade pretzels. Now I’m inspired! I’m going for the “everything” version! Ohhhh we love these pretzels. Yours really do look perfect! My 10-year old has a “thing” for soft pretzels, and he would think he had gone to heaven if I made these for him.